Combine the crushed cookies and melted butter in a medium bowl and mix well. Press mixture firmly and evenly into the bottom and up the sides of a 9- inch pie or tart pan. Bake for 8 minutes. Set aside and allow to cool completely before filling. Stir sugar and water in a heavy saucepan over low heat until sugar dissolves. Increase heat and boil until the syrup is an amber color, swirling the pan occasionally and brushing down the sides with a wet pastry brush, about 6 minutes. Remove from heat. Add cream, butter, vanilla, and pinch of salt (the mixture will bubble up). Return pan to very low heat; stir until caramel is smooth and the color deepens, about 5 minutes. Refrigerate the caramel uncovered until cold but not firm, about 15 minutes, before pouring into prepared crust. It should fill a little more than halfway. Return to refrigerator and allow the caramel to firm up for about an hour or two. Bring cream to a boil in a heavy saucepan. Add the chocolate and whisk together until smooth. 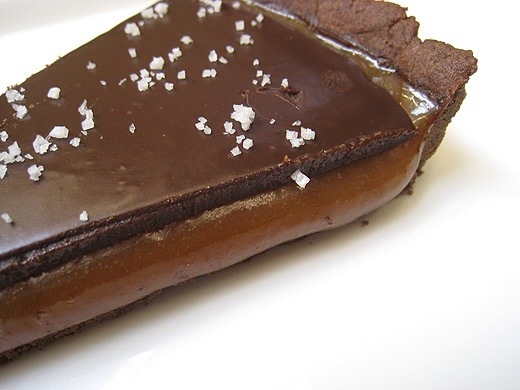 Pour the chocolate filling carefully over the caramel layer to cover. 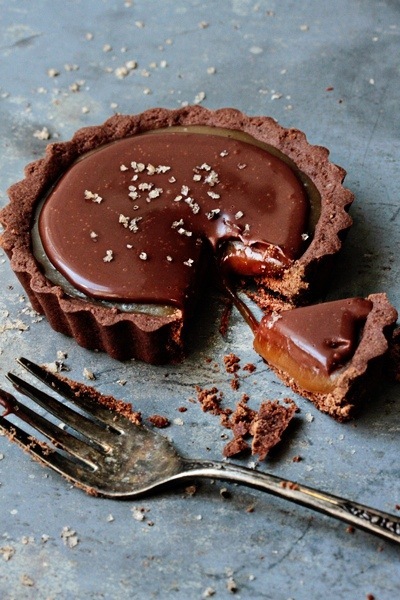 In the end, you want slightly more caramel than chocolate in the tart. Refrigerate for about an hour or two until firm. Sprinkle finished pie with sea salt, slice and serve chilled. Store any uneaten portion in the refrigerator.